In Key Stage 1, one child from each class is selected every other Thursday and presented with a sticker and certificate for trying hard to improve their handwriting and forming letters neatly and correctly. Their work is then displayed on the ‘Star Writer’ display in the Key Stage 1 corridor opposite the ICT suite. In Key Stage 2, one child from each class is selected every other Thursday and presented with a sticker and certificate for forming letters correctly and neatly. Their work is then displayed on the ‘Star Writer’ display in the Entrance corridor. Children can achieve a stamp for neat handwriting in all areas of the curriculum. In Key Stage 1 the children aim to achieve 8 Neat Writing stamps on their chart to achieve a silver pencil. Once the silver pencil has been achieved the children need to achieve a further 8 stamps to receive a sparkly pencil. Both these will be presented to the children in assembly. 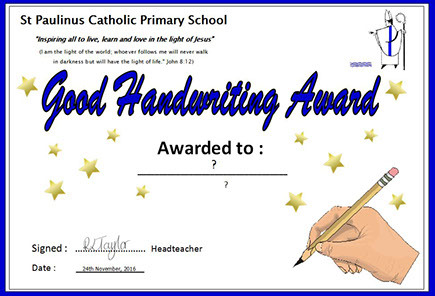 In Key Stage 2 the children aim to achieve 8 Good Handwriting stamps on their chart, to achieve their pen licence. These stamps can be achieved throughout a variety of subjects/pieces of work and will not necessarily all be received by the end of this school year. Children will be presented with their pen and pen licence in assembly. Here at St Paulinus, we use the Oxford Reading Tree reading scheme. This is the UK’s number one reading programme and it has taught millions of children to read and to love to read. Rooted in reading for pleasure and with systematic phonics at its heart, Oxford Reading Tree’s well-loved characters, breadth and unrivalled support give you everything your children need to become confident readers – and the new National Curriculum loves it too! We have individual books covering all abilities from EYU to exceeding in Year 6. In addition to the Oxford Reading Tree scheme, we have some Pearson Bug Club books. In school we complete weekly guided reading sessions, these are done in groups no bigger than 6 and develops comprehensions skills. Each child has an individual reading book and record which is read in school to an adult and taken home on a daily basis. It is changed at least once a week. We have a Key Stage 1 and a separate Key Stage 2 library and children have access to this once a week in key stage 1 and once every fortnight in key stage2. We are very lucky to have reading interventions running throughout this school, such as Every Child a Reader, additional 1:1 reading and Reading Friends. EYU cover phases 1, 2 and 3 with the exceeding children accessing phase 4. At the end of EYU, teachers meet and share which phase each child is working on. Therefore in Year 1, the child will start at the same phase in which they left EYU, covering up to phase 5 and the exceeding children moving onto phase 6. The same action happens when the children move from Year 1 to Year 2, however, the exceeding children in Year 2 move on to support for spelling. Those children who are emerging still in Year 2 will access Read, Write, Ink intervention when they start in Year 3. If you are unsure of any sounds you can look on Youtube but make sure it is an English version not American. Phase 1:-Phase One concentrates on developing children’s speaking and listening skills and lays the foundations for the phonics work which starts in Phase 2. The emphasis during Phase 1 is to get children attuned to the sounds around them and ready to begin developing oral blending and segmenting skills. It is divided into seven aspects: General Sound Discrimination – environmental, General sound discrimination – instrumental sounds, General sound discrimination – body percussion, Rhythm and rhyme, Alliteration, Voice sounds and Oral blending and segmenting. It is intended that each of the first six aspects should be dipped into, rather than going through them in any order, with a balance of activities. Aspect 7 will usually come later when children have had plenty of opportunity to develop their sound discrimination skills. Each aspect contains three strands: Tuning in to sounds (auditory discrimination), Listening and remembering sounds (auditory memory and sequencing) and Talking about sounds (developing vocabulary and language comprehension). As soon as each set of letters is introduced, children will be encouraged to use their knowledge of the letter sounds to blend and sound out words. For example, they will learn to blend the sounds s-a-t to make the word sat. They will also start learning to segment words. For example, they might be asked to find the letter sounds that make the word tapfrom a small selection of magnetic letters. Phase 3:-By the time they reach Phase 3, children will already be able to blend and segment words containing the 19 letters taught in Phase 2. Phase 4:- In Phase 4, no new graphemes are introduced. The main aim of this phase is to consolidate the children’s knowledge and to help them learn to read and spell words which have adjacent consonants, such as trap, string and milk. Phase 5:- Children entering Phase Five will already be able to read and spell words with adjacent consonants, such as trap, string and flask. They will also be able to read and spell some polysyllabic words. Children will learn more graphemes and phonemes. For example, they already know ai as in rain, but now they will be introduced to ay as in day and a-e as in make.Alternative pronunciations for graphemes will also be introduced, e.g. ea in tea, head and break. Phase 6:- At the start of Phase Six, children will have already learnt the most frequently occurring grapheme–phoneme correspondences (GPCs) in the English language. They will be able to read many familiar words automatically. When they come across unfamiliar words they will in many cases be able to decode them quickly and quietly using their well-developed sounding and blending skills. With more complex unfamiliar words they will often be able to decode them by sounding them out. At this stage, children should be able to spell words phonemically although not always correctly. In Phase Six the main aim is for children to become more fluent readers and more accurate spellers. The phonics screening check is a short, simple assessment to make sure that all pupils have learned phonic decoding to an appropriate standard by the age of 6. All year 1 pupils in maintained schools, academies and free schools must complete the check, in June. The check is made up of a list of 40 words, 20 real words and 20 non-words which the child will read one-to-one with a teacher. There are lots of resources available to support your child’s learning with this on the internet. A practice phonics screening test will be sent home in the autumn term and spring term. Here is a link that provides sample materials and a training video for adults. Topic is a great but vital part of the curriculum where your child can learn about the past, make links to their life and know about the world. Topic covers four main areas of the National Curriculum which include History, Geography, Art and DT. It is encouraged to develop awe and wonder along with creativity. Children need to have a well-balanced education to strive towards success and allows children the opportunity to flourish in different areas besides Maths and English. Ten hours of Topic are taught as a minimum every term and a new topic is introduced each term. Your child will study a total of three different topics per year. As a parent you can help and support your child by encouraging curiosity in the world and making links to the past and comparing to the present day. You can research with your child and find different places on a map. Ask your children to draw pictures and focus on detail and encourage your children with model making to keep learning fun. A list of websites have been added which offer extra support to help with homework projects and to learn through games. Any problems or questions do not hesitate to contact Miss Naylor who will be more than happy to help. Through Science at St Paulinus children learn how to work scientifically and develop essential skills which can be applied to different topics and areas of the curriculum. We have a large focus on the five key principles of Working Scientifically: Research, Fair Testing, Identifying and Classifying, Observing Over Time and Pattern Seeking. Children have the opportunity to learn through hands on practical lessons, carry out their own investigations and present their work in a variety of ways. Throughout school, children cover a variety of topics including: Living Things and their Habitats, Sound, Animals Including Humans, Electricity, Plants, Everyday Materials, Seasonal Change, Light, Rocks, Forces and Magnets, States of Matter, Earth and Space, Properties of Materials and Evolution and Inheritance. At St Paulinus we also host an annual STEAM Week (Science, Technology, Engineering, Art and Maths) which enables the children to work off timetable for a full week and work on a variety of projects with a central theme. Parents/Carers are invited to visit their child’s class at the end of the week to celebrate and even partake in some of the learning! We greatly encourage children to be curious and to explore the world around them. Below are a list of websites/places of interest that could be used to further support and deepen your child’s interest in science. Supporting your child is the best method of helping your child. Making good use of the useful links can enhance further development and understanding . – practice 4 number operations (add, subtract, multiply and divide) using the formal written method.